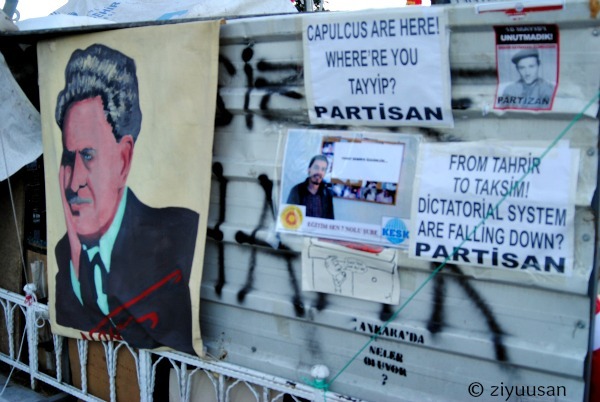 Taksim Square, June 10, 2013. 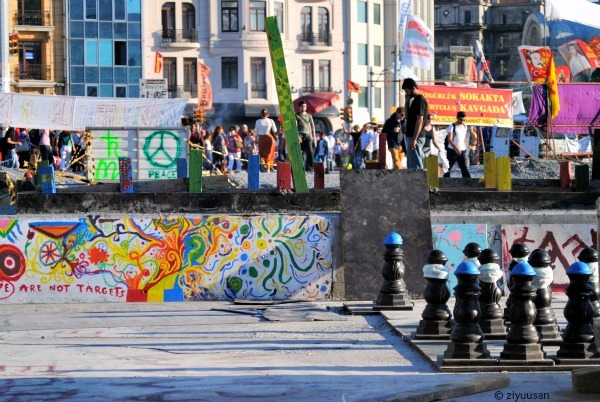 June 6 to 12 I’ve been living in Istanbul in an apartment some 50 meters away from Taksim Square and Gezi Park, the hub of the protests and riots that have been disrupting Turkey since the end of May. 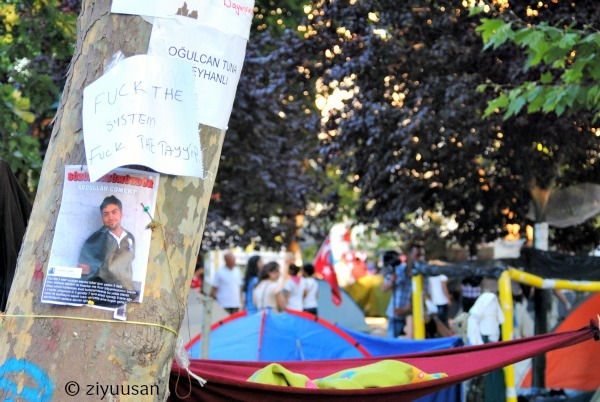 For the first days, things were all in all pretty quiet: the Park was occupied and every evening peaceful protests would take place along Istiklal Caddesi (Istanbul’s main international shopping street that departs from the Square) by as diverse a crowd as peaceful and democratically reasonable were (are) their demands: spare the Park from yet another mall, grant the right to freedom of expression, association and assembly, allow free and independent media. 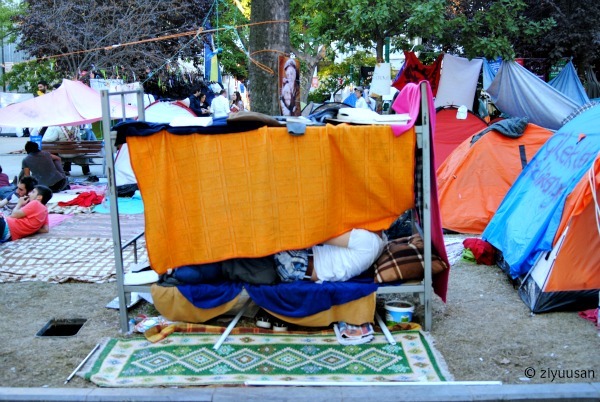 I went into the Park on Monday the 10th, looking at and talking to its occupants, sympathizers, ordinary citizens who were reading, holding group discussions, distributing leaflets, singing or simply resting. 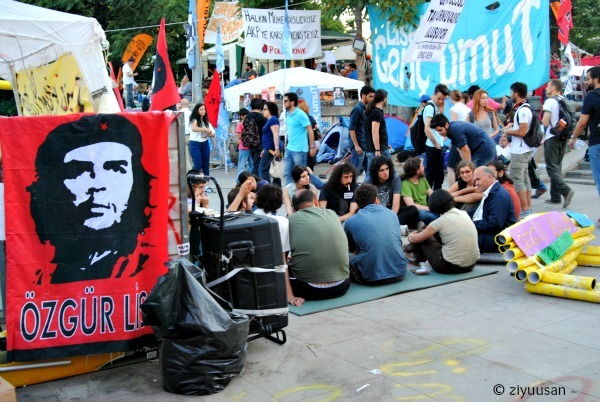 One couldn’t help but notice the diversity within the crowd and amongst these groups: youth and elderly, anarchists, communists, environmentalists, students, university professors, housewives, parents with children and more. 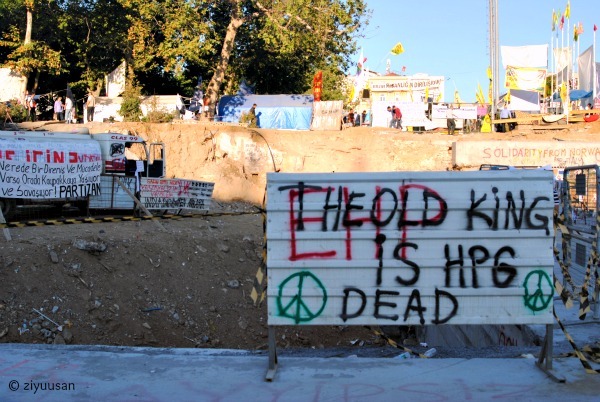 The atmosphere was jolly and absolutely peaceful, rather inspiring and energizing, reminiscent of 1968 or of school strikes. Yet deep inside you knew this wouldn’t last and it wasn’t but a matter of time till things would take a different course. 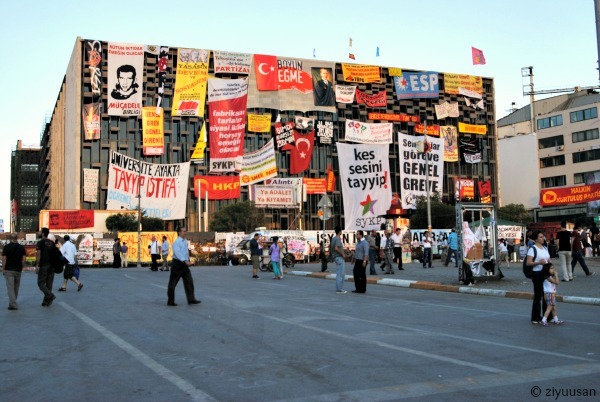 The Atatürk Cultural Centre has been covered with flags and banners since protesters took to the streets on May 28, 2013. 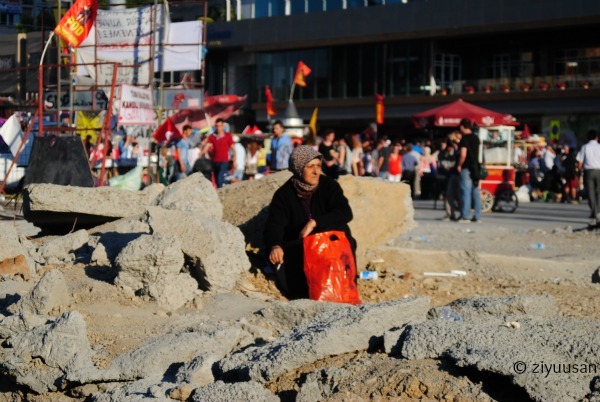 A Turkish woman has a smoke amongst the ruins in Taksim Square. 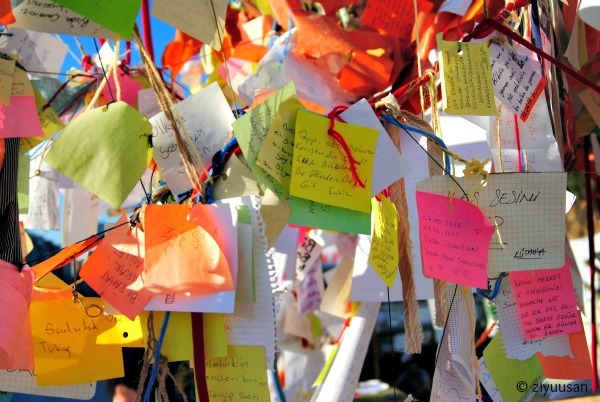 Colorful notes and messages hang by the entrance to Gezi Park. 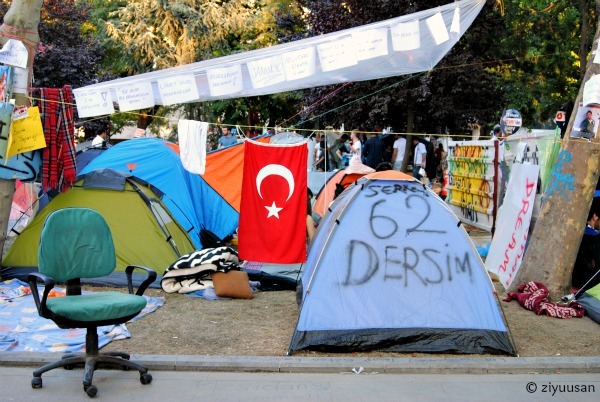 The Park has been occupied since May 28, gaining increasing international attention and sympathy. 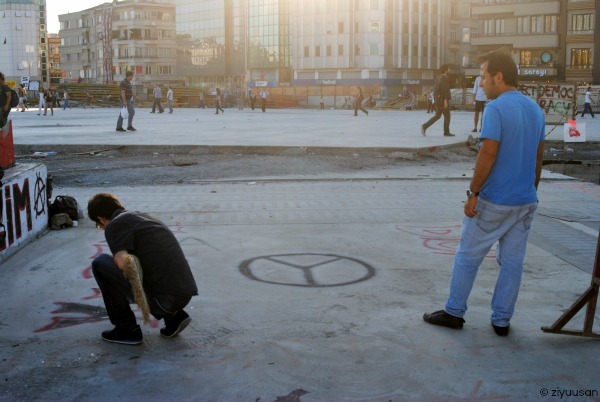 Evidence of the first clashes is still fresh all around Taksim Square and Gezi Park. 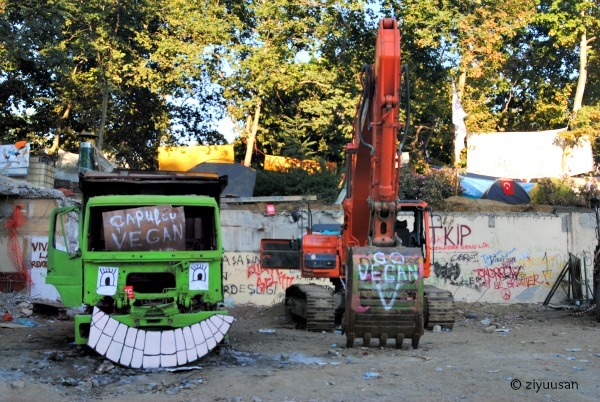 And so is its revolutionary version. 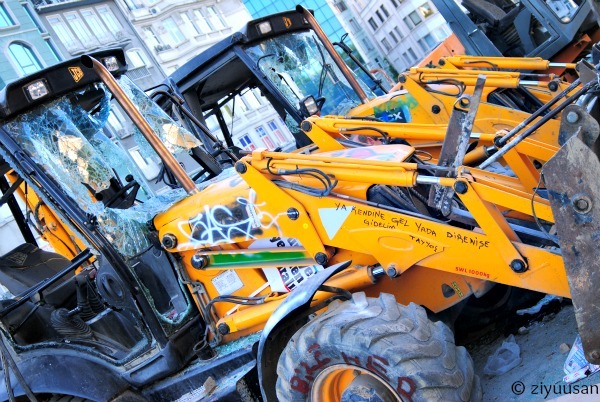 What has unexpectedly turned into a harsh confrontation has always been meant by the protesters as an absolutely peaceful demonstration. 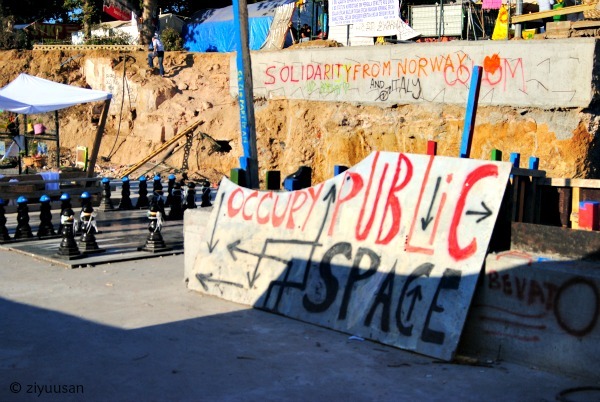 Police caps are placed on top of chess pieces in Taksim Square next to Gezi Park. 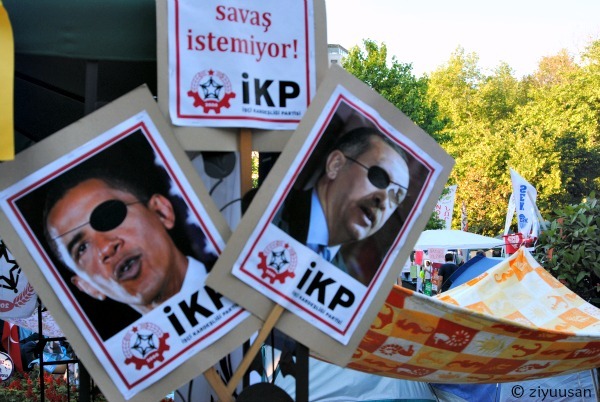 Against a large crowd of peaceful protesters, the Turkish police has overreacted with an overly brutal reaction condemned by many international observers. Free and objective media remains one of the main demands of the Turkish protesters. Some of them also blamed the international media of not paying timely and accurate attention to what was happening on the ground in the country. Unsurprisingly, jointly with accusations towards domestic and foreign media also come some anti-American sentiments. 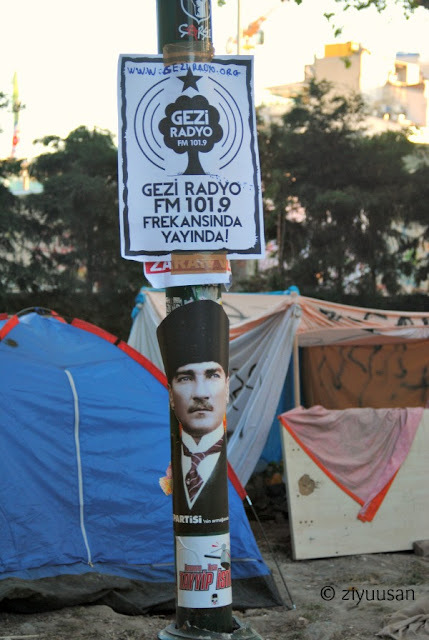 Tents, impromptu desks and sleeping arrangements of any kind fill the entire premises of Gezi Park. 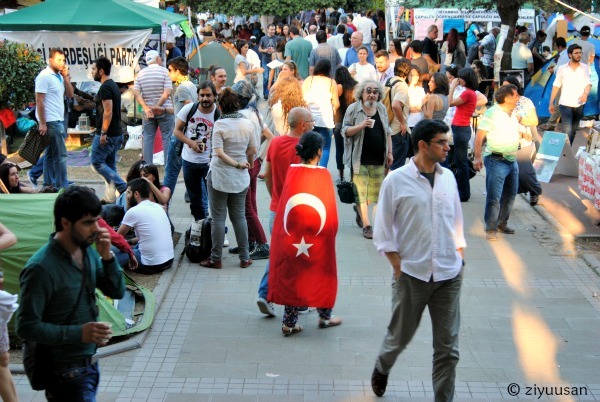 The crowds inside Gezi Park long for a modern, democratic and tolerant Turkey in the spirit of Mustafa Kemal Atatürk, founder of the Turkish secular state. 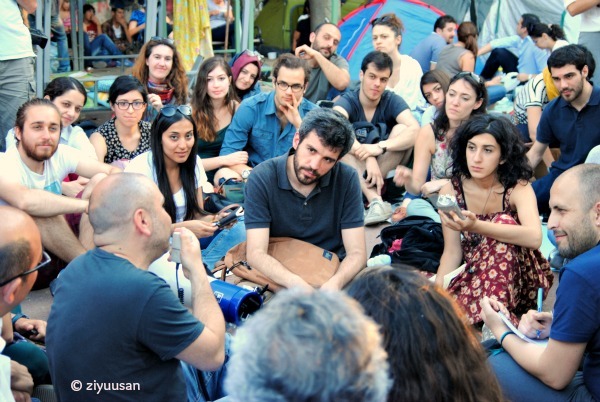 A group of occupants debate inside Gezi Park. 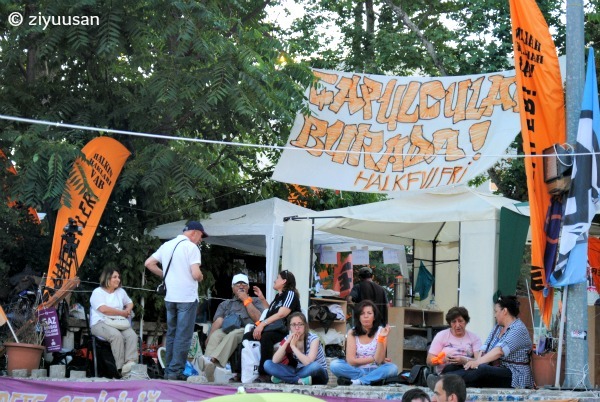 Young and older women also join the occupation and protests. 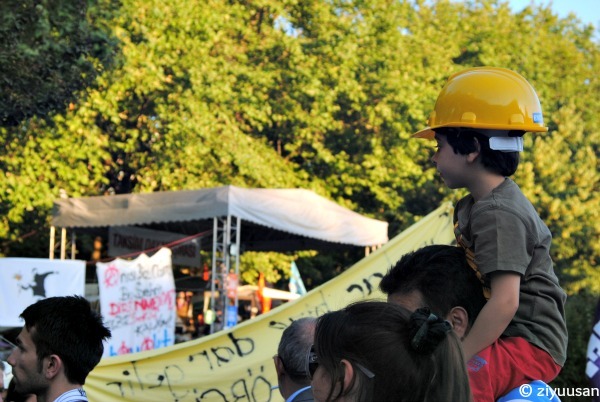 A child wearing an helmet sits on his father’s shoulders at one of the gatherings inside Gezi Park. 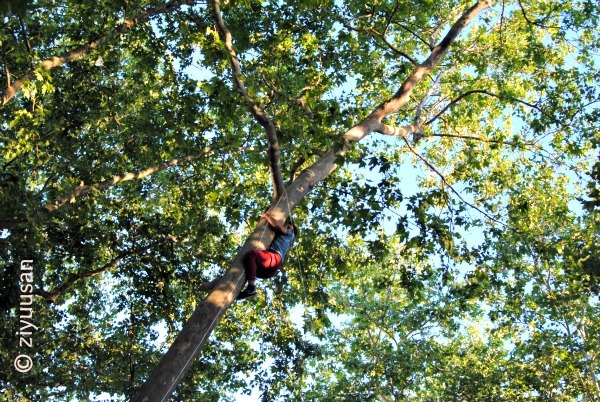 A young man climbs a tree to hang a banner inside Gezi Park. 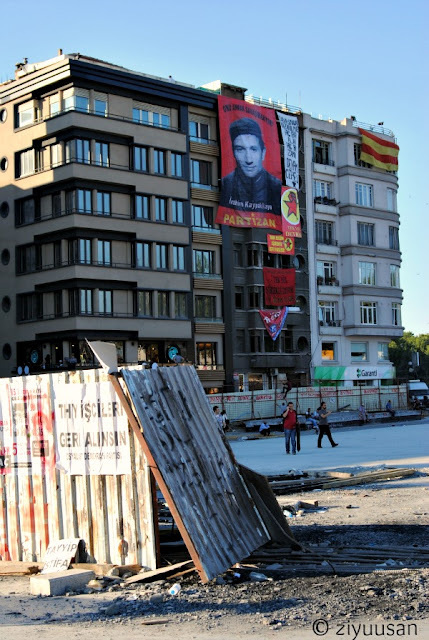 Memories are still alive of those who lost their lives in the first stages of the Turkish uprising. 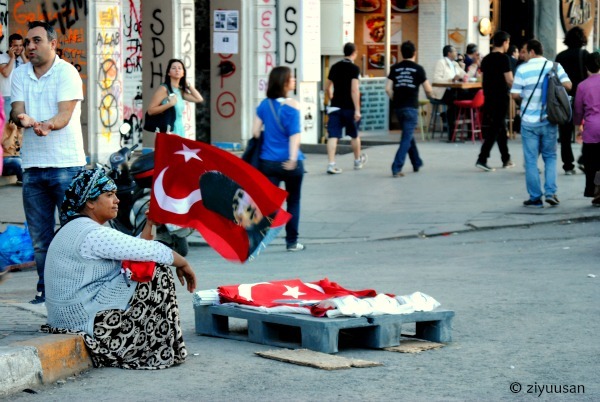 … together with Turkish flags, here on sale in Taksim Square. 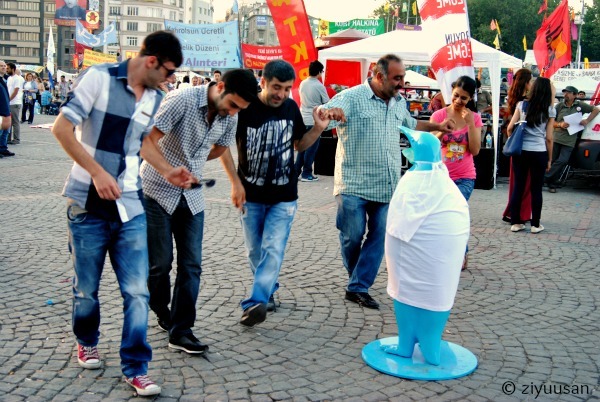 “Hooligans, thugs and looters” – as Prime Minister Tayyip Erdogan called the protesters – dance in Taksim Square. 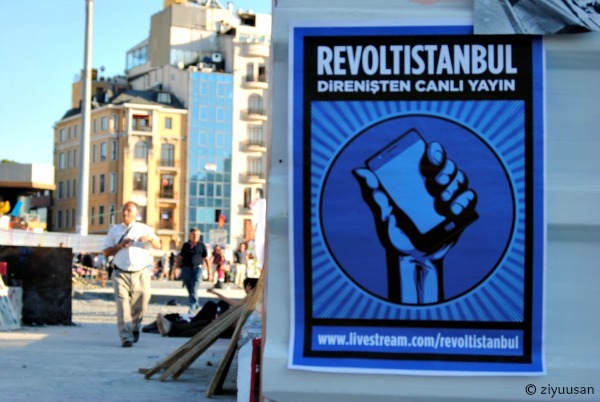 Started as an innocent riot against the destruction of Gezi Park, the “Turkish revolution” quickly developed into an anti-dictatorial uprising against the regime of Recep Tayyip Erdogan, considered as a dictator by the opposition party and many protesters. 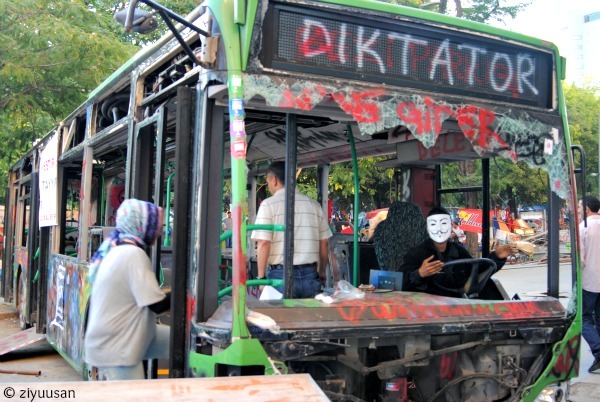 A young Turkish indignado sits at the steering wheel of a bus damaged during the riots outside Gezi Park. All rights reserved. For any reproduction, please contact me.